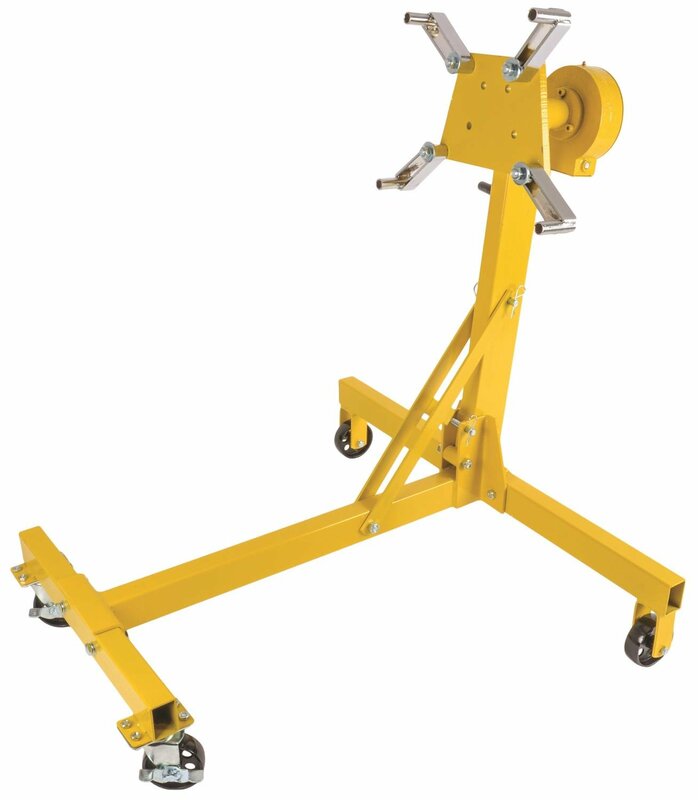 JEGS 80098 - Folding Engine Stand 1250 lbs. 80059 is rated 4.2 out of 5 by 35. Rated 5 out of 5 by DakotaDuster from Great! Most gear heads have been there. Trying to muscle an engine over on the stand in a controlled fashion with plenty of close calls or for some even tipping the engine over. The ease and control of this thing makes engine work just that much less stressful and tiresome. Feels sturdy, looks good especially since my car is yellow, and easy assembly. Rated 5 out of 5 by Bird of Prey from Great Engine Stand I have waited months if not years for a competative price on this rotating engine stand. The assembly instructions were concise and easy to follow. I was amazed how well it withstood the weight of my engine and it rotated with little wasted motion. This engine stand is a tool favorite for every professional and DIY merchanic. Give it 5 stars. Rated 5 out of 5 by BooMan from Nice piece.. I've wanted one of these for awhile but couldn't justify the cost.. The time came that I needed a second stand n I had to take the plunge! Overall it's a nice stand the packing could be upgraded along with the hardware...After purchasing grade eight nuts bolts n washers its assembled n working as anticipated...The gearbox could be a bit tighter but all in all "Yes I Would Recommend This Stand To Anyone Looking To Upgrade ! Rated 5 out of 5 by jeansonne from awesome had been needing one for twenty years,,,, finally got one and it is exactly what i was hoping for. Rated 5 out of 5 by js292 from Works great I've wanted this stand for a while and it did not disappoint. Turing a big block long block is now a breeze. The only disappointing thing was when I got a another order a week latter from Jegs that had a flier in it with the stand for $30 cheaper. Rated 5 out of 5 by Johnny4 from Highly recommend! Bought this to do an engine swap on my mustang but ended up needing it for a Huyndai Tucson job. Worked great, easy to put together, quality is much better than I expected. Price was cheaper on Jegs than any other site I could find. Makes working on different locations of the engine easy with the worm drive. Rated 5 out of 5 by David Allen from One Great Tool I Bought One & I Liked It So Much That I Bought A Second One. This Will Really Speed Up Engine Work Tear Downs & Assembly. do you have replacement arms ?